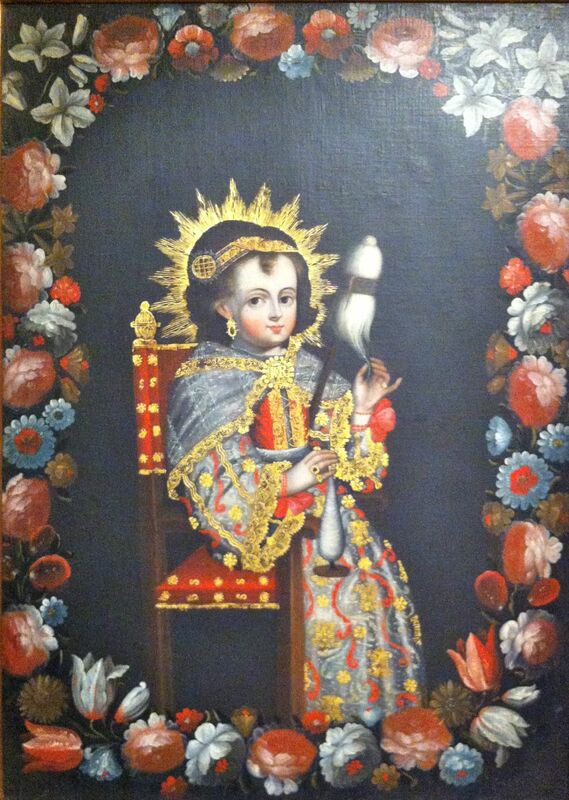 At the Musée des beaux-arts the other day, visiting the exhibition on Peruvian art and culture, I was intrigued with this 18th century (Cuzco School) painting of Mary. The painting owes a great deal to European traditions – both artistic and religious/cultural – and to some extent represents the effort to convert Inca peoples to Christianity. There is, then, much that is ambiguous about it. Yet there is also much that is interesting and hopeful about it. The image casts Mary as a child weaving, with traditional indigenous weaving materials. This owes to two things: a tradition from the (non-canonical) gospel Pseudo-Matthew which represents a young Mary as spending her time weaving from the 3rd to the 9th hour; and, the tradition of weaving that was common among the indigenous peoples. The painting represented an attempt to both valorize the everyday activity of weaving and to draw a link between Christian spirituality and the indigenous women of Peru. 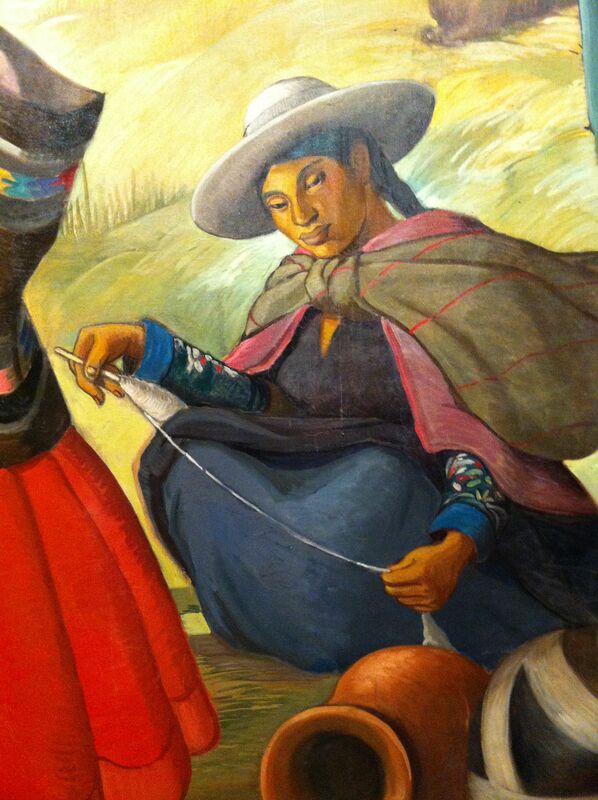 Thus we have the following detail from a painting of the (later) indiginismo movement in Peru, which shows women with similar spinning materials. Aside from hesitations on questions of Mariology (and on the elevation of cloistered life, where weaving was done) and also acknowledging the colonialist heritage represented in the first painting, there is nevertheless a very real valorization of the tasks and vocations of everyday life as these are given by the God of creation/covenant and as they are experienced/lived in the Spirit. There is an effort to take seriously the life and experiences of those to whom the gospel is being related. The gospel of Jesus Christ encounters the culture, valorizes aspects of it, and insists that here the Spirit of the risen Jesus (of the creator God) is present. A few decades ago the Swiss theologian Karl Barth offered a suggestion to young seminary students and theologians, a suggestion we are going to take him up on over the next few weeks. Barth suggested that they read with the bible in one hand and the newspaper in the other hand.